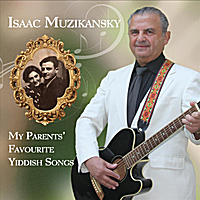 Isaac dedicated this CD to the memory of his dear parents Tzipoira & Gersh-Tzvi Muzikansky, who taught him these songs while he was a child growing up in the spiritually frozen lands of the former Soviet Union. The CD launch took place on September 15, 2011 at the Soloway Jewish Community Centre in Ottawa, Ontario. I thank all of you who came here this evening. I also would like to thank again all of the musicians who helped me to bring the release of the CD to its fruition. And now I would like to say few words about my dear parents to whose memory I dedicated this CD. My father Gersh-Tsvi was born in 1911 in Kishinev, Bessarabia in a very traditional religious family of 8 children. Bessarabia (now called Moldova) was at the time a part of Romania. My father was the second oldest child in the family. From an early age he had to learn a trade as a metal plater to help his ailing father support the family. My mother Tzipoira was born in 1915 also in Kishinev and also in a religious family of 6 children. My parents married young. Soon after, my elder sister Adel was born. Those were the years of the great depression and my Dad was in and out of a job. In 1939 Stalin made a pact with Hitler and as a part of the deal, Stalin annexed Bessarabia which became a part of the Soviet Union in 1940. On June 22, 1941 Hitler annulled the pact and attacked the Soviet Union. A few days later my Dad was drafted into the Russian army to fight the Nazis. In 1943 during the Stalingrad battle (as you know, one of the biggest battles of all time) he was wounded and transferred to a hospital in the Ural mountains. After he recovered from his wounds, he was transferred to the plant that built tanks for the army. By sheer luck through the Red Cross, he found my mother and my sister who were evacuated deep in Russia and were almost dying from hunger. After their re-union my parents were never separated from each other again. The war had caused total destruction of the European part of the Soviet Union and soon after my twin sister Anna and I were born. Our life was very tough. In spite of all the difficulties in their lives, my parents’ spirits were never broken and they never gave up their dreams of keeping the Yiddishkeit alive in our family. A big part of this was the Yiddish music and the songs they sang together almost every evening after dinner. I learned from my parents many Yiddish songs and some of them became part of the released CD. I had been dreaming for a long time of making a CD dedicated to my parents and finally my dream has become a reality. From the bottom of my heart I thank again everybody who has helped me to make this CD, especially Dr. Larry Tarof, Mila Kotov, Shaina Lipsey, Don McVeigh, Ian Schwartz and Peter Teitelbaum. Also I thank our good friends Doris Resnik and Jack Wolofsky from Montreal and my dear wife Mara for the inspiration. Special thanks to my sponsors Gladys & John Greenberg, Dora & Sam Litwack, Corinne & Sheldon Taylor and Kay & Jack Wolofsky. Also I thank very much Steve Shapransky for playing tonight and last but not the least Ros Wollock for helping to organize this event. We have prepared a program of songs to play tonight. The majority of the numbers are from the CD. We hope you enjoy our program. Thank you again for coming tonight and making the launch of my CD such a success. For all the musicians, including myself, it was so nice and exciting to see enjoyment on your faces. We could feel that you really enjoyed the concert and this feeling has “made our day”. This evening was a tribute to my parents' lives and a celebration of Yiddish culture. The High Holidays are fast approaching and I would like to wish you all a Happy, Healthy, Sweet New 5772 Year. May all of your dreams come true in the New Year.